Our story today comes out of Charlotte, North Carolina reported by Newschannel 36 where a woman keeps her safety and her cash. The full story can be found here. CHARLOTTE, N.C.-- A woman fights back against an attacker in a parking lot. 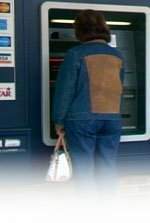 Investigators say a man walked up to a woman at the ATM in the Quail Corners Shopping Center on Park Road Friday night. Police say the victim threw her money in the back seat of the car so the man couldn't reach it, and then kicked him in the chest. The man hasn't been caught.